Next spring (May 2013 to May 2014), the San Francisco Museum of Modern Art (SFMOMA) in partnership with the National Park Service (NPS) and Golden Gate National Parks Conservancy will present a major outdoor exhibition of sculptor Mark di Suvero’s works near the Golden Gate Bridge. Eight large-scale steel sculptures will be installed at historic Crissy Field, a former airfield and military base that is now one of the most visited national park sites within the Golden Gate National Parks. Curated by SFMOMA Director Neal Benezra, Mark di Suvero at Crissy Field surveys five decades of the artist’s work including a recent sculpture that has never before been on public view. The temporary exhibition will be the largest display of di Suvero’s work ever shown on the West Coast, and free for all visitors, extending the programs celebrating the Golden Gate Bridge’s 75th anniversary. Coinciding with di Suvero’s 80th birthday, the exhibition holds particular significance for the artist who emigrated from Shanghai to San Francisco at the age of seven. His passage beneath the Golden Gate Bridge—which opened a few years before his arrival—proved to be a lasting inspiration, as the scale and color of the structure have inspired di Suvero throughout his life. di Suvero notes, "It was like a rainbow, a bridge coming to the New World starting a new life. The woman who chose the color of the bridge, Malo Lowell, taught me how to work wood as a teenager and from there, all was freedom." Mark di Suvero at Crissy Field will kick off SFMOMA’s extensive slate of off-site exhibitions and programming as part of the next phase of the museum’s expansion project. The exhibition opens just prior to when SFMOMA will temporarily close its building for construction and begin its two and a half year off-site phase beginning in June 2013. We could not be more thrilled to embark on the museum’s new phase by celebrating one of the greatest artists to come from San Francisco, in a setting beside an iconic and beloved Bay Area landmark,‖ notes Benezra. "We are incredibly excited about this unique collaboration between SFMOMA and the NPS and Parks Conservancy to present these extraordinary works of art to the widest audience possible, against such a fitting, historic, and striking backdrop." Mark di Suvero at Crissy Field continues the NPS and Parks Conservancy’s ongoing commitment and deep relationship with the city that is home to the Golden Gate National Parks. "Just like di Suvero’s exhibition earlier this year at Governors Island, an NPS site in New York Harbor, this exhibition will give us an opportunity to further explore how art can create a new understanding and appreciation for a historic landmark like Crissy Field,‖ said Golden Gate National Recreation Area Superintendent, Frank Dean. "The fact that di Suvero is a sculptor with local roots and influences adds another dimension to the story," he noted. Greg Moore, President and CEO of the Golden Gate National Parks Conservancy, added, "We are grateful to partner with a world-class museum that is bringing the work of an internationally renowned artist to an extraordinary national park. We all take inspiration from the Golden Gate Bridge and the beauty of the park lands surrounding this beloved landmark; di Suvero’s work joins us in that uplifting emotion." Raised in the Bay Area, di Suvero is an internationally acclaimed sculptor whose unique bold physical style has made him one of the most influential sculptors of our time. He uses a variety of industrial materials to build dynamic works that create an active dialogue with their outdoor settings. Despite the monumentality of these sculptures, they imbue a sense of peace, beauty, and order also found in their natural surroundings. Spanning up to 50 feet high and 40 feet wide, di Suvero’s works will especially resonate at Crissy Field, with its immediate views of the Golden Gate Bridge, from which the artist has long taken inspiration. His monumental steel sculptures convey powerful emotion, while also revealing the artist’s masterful sense of form, composition, and movement. 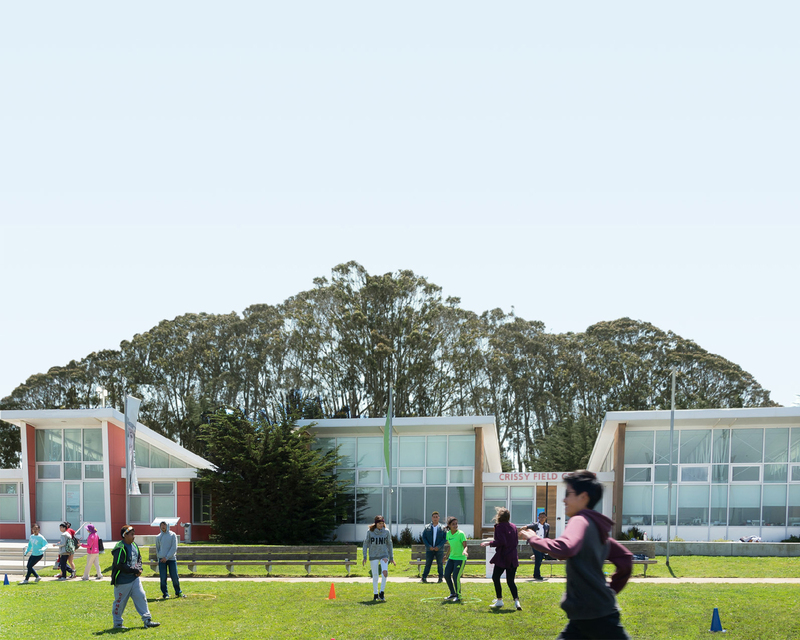 Mark di Suvero at Crissy Field will activate the outdoor space in a new and engaging way while drawing connections to the area’s rich history and distinctive waterfront presence. Through this exhibition, the unique account of Crissy Field and the San Francisco Bay as a gateway to immigration will be told in the personal story of di Suvero’s experience. In addition, these massive sculptures made predominantly of industrial steel I beams serve as a reminder of the impact of steel production on industry, technology, and the military, which greatly influenced the landscape of Crissy Field from its previous use as an airfield and military base. Abstract in nature, the works offer viewers an opportunity to draw more subtle connections to the surrounding environment, as with Dreamcatcher (2005–12), whose angular top will spin when activated by the winds at Crissy Field. Most sculptures featured in the exhibition will be lent by the artist, including Magma (2008), which will be publicly on view for the first time. Other works include key local and national loans, including one from the private collection of Mrs. Donald Fisher and others from the Hirshhorn Museum and Sculpture Garden, Washington, D.C., and Storm King Art Center, Mountainville, New York. SFMOMA, the NPS, and the Parks Conservancy are also planning to develop joint educational programming and interpretative content in conjunction with the exhibition. Born in Shanghai, China in 1933, Mark di Suvero emigrated to the U.S. in 1941 and settled in San Francisco. He graduated with a degree in philosophy from the University of California, Berkeley, in 1957. In 1960, early in his artistic career, di Suvero was paralyzed in a near-fatal accident while working part-time for a construction company. While in a wheelchair, he mastered a welding technique that allowed him to begin making sculptures in steel. While the artist has lived and worked in New York since 1957, he has never lost sight of his connection to the Bay Area, maintaining a second studio in Petaluma. Local institutions, including the City of San Francisco, Fine Arts Museums, Oakland Museum of California, and SFMOMA, have collected his work. At SFMOMA, di Suvero’s Ferro (1978–82) is in the permanent collection and currently on view in the museum’s Rooftop Garden; four di Suvero sculptures are also a part of the Fisher Collection. Other works currently on view in the Bay Area include Pax Jerusalem (1999), installed at the Legion of Honor; Sea Change (1995) at South Beach Park near the AT&T Stadium; and Miwok (1981–82) at Stanford University’s School of Medicine Dean’s Lawn. di Suvero’s works have been shown in many galleries and museums in the U.S., Europe, Asia, and Australia since the 1960s. His work has also been featured in a series of major outdoor exhibitions in cities since the early 1970s, including in 1975 the first exhibition of a living artist at the Tuilleries in Paris and then a citywide exhibition presenting work in all five boroughs in New York City. Later shows were presented in Stuttgart, Germany; Valence, France; Nice, France; Venice, Italy; Paris, France; and most recently on Governors Island in New York City, presented by the Storm King Art Center. In the U.S., cities with permanent installations of di Suvero sculptures include Baltimore, Dallas, Grand Rapids, Houston, Los Angeles, Minneapolis, St. Louis, San Francisco, South Bend, and Toledo. di Suvero has also largely been active in public art projects and supporting the cultural community. He was one of the co-founders of the Park Place Gallery, which opened in 1963 as a cooperative space where works of emerging artists were shown, and in 1977 he founded the Athena Foundation, helping artists achieve their creative goals. In 1986, he created the Socrates Sculpture Park, where he and a coalition of community members and artists transformed an abandoned landfill in Queens into an exhibition space and studio for artists, as well as a park for community residents. In 2006, di Suvero received the Heinz Award in the Arts and Humanities for his contributions to American culture through his artwork, his commitment to helping other artists, and his creation of new venues for the visual arts. In 2011, President Obama honored di Suvero with the 2010 National Medal of the Arts; the president commended his work for its ability to portray both social and political vision. During the construction of SFMOMA’s building for its major expansion project, the museum will go beyond its walls and directly into the community with extensive off-site programming. An array of collaborative and traveling museum exhibitions, site-specific installations, and neighborhood festivals will unfold throughout the Bay Area from the spring of 2013 to early 2016. In addition to Mark di Suvero at Crissy Field, other site-specific projects during this period will include a city-wide exhibition including newly commissioned, site-responsive artworks at Los Altos in fall of 2013; a multi-location display of Doug Aitken’s Empire trilogy (2008–14) in 2014, showing all three video installations simultaneously for the first time; and off-site presentations of the museum’s ongoing SECA Award shows and New Work series. Throughout this two and a half year period, SFMOMA will experiment with new ideas, engage in dialogue with a range of cultural partners, and create innovative ways to experience the museum’s collection, bringing the best of these ideas and initiatives back into its newly expanded home. Additional off-site programs are currently in development; as plans evolve, more details will be announced. Founded in 1935, SFMOMA was the first museum on the West Coast devoted to modern and contemporary art. From the outset, SFMOMA has championed the most innovative and challenging art of its time, and continues to exhibit and collect work by both modern masters and younger, less established artists. The museum’s internationally recognized collection includes some 30,000 works, featuring strong holdings in photography, painting and sculpture, architecture and design, and media arts. The National Park Service (NPS) is a federal agency within the U.S. Department of the Interior charged with managing the preservation and public use of America’s most significant natural, scenic, historic, and cultural treasures. The NPS manages the Golden Gate National Parks, as well as 397 other park sites across the U.S. For more information, visit www.nps.gov/goga or call (415) 561 4700. The Parks Conservancy is the nonprofit membership organization created to preserve the Golden Gate National Parks, enhance the experiences of park visitors, and build a community dedicated to conserving the parks for the future. The Conservancy is an authorized ―cooperating association‖ of the National Park Service, and is one of more than 70 such nonprofit organizations working with national parks around the country. To learn more, please visit www.parksconservancy.org or call (415) 561 3000. Admission prices: visit sfmoma.org/tickets for pricing information. SFMOMA is easily accessible by Muni, BART, Golden Gate Transit, SamTrans, and Caltrain. Hourly, daily, and monthly parking is available at the SFMOMA Garage at 147 Minna Street. For parking information, call (415) 348.0971. Visit our website at sfmoma.org or call (415) 357 4000 for more information. SFMOMA is supported by a broad array of contributors committed to helping advance its mission. Major annual support is provided by Grants for the Arts/San Francisco Hotel Tax Fund. First Tuesdays are always free, thanks to AT&T. Support for Thursday Nights at SFMOMA is provided by yp.com. W San Francisco is the official hotel of Thursday nights at SFMOMA. KidstART free admission for children 12 and under is made possible by Charles Schwab & Co. Inc.